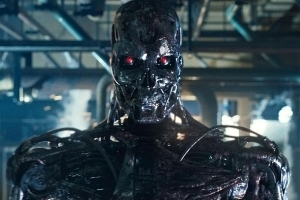 20th Century Fox and Paramount Pictures are taking another chance on the Terminator franchise. James Cameron is on board as a producer this time and has been spilling some details while out promoting Alita: Battle Angel, a film he produced alongside Robert Roderiguez who directed. First of all it's confirmed that Terminator 6 is currently called Terminator: Dark Fate, but Cameron is quick to mention that that could change. The other big confirmation is that Arnold Schwarzenegger will indeed be playing a Terminator in the new film. Speaking to IGN, Cameron said, "Arnold’s back and he’s bad… he’s a different Terminator than you’ve ever seen before, I mean literally, he’s a different chassis number, but he’s also a very different guy than you’ve seen before." Linda Hamilton will also return as Sarah Conner while Mackenzie Davis and Natalie Reyes play new characters. Gabriel Luna (Agents of SHIELD, Dark/Web) is also playing another new Terminator this time around. Tim Miller (Deadpool) is directing, working from a script by Billy Ray (Overlord) David S. Goyer, Justin Rhodes, Josh Friedman, and Charles H. Eglee. Terminator: Dark Fate comes out November 1, 2019.